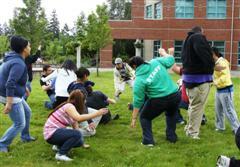 Learn games to break down participant barriers and build cohesion in the group. Discover ways to help the group develop individual and group skills leading to the group’s quick success. Walk away with dozens of new tools and techniques for working with groups to focus on play, safety, life skills, and team building.